OK, I promise – not another April Fools post like last year. Just a regular pic o’the day, this time from “The Odds Against Donald Jordan”, the Mannix episode that was first aired on March 1, 1969. 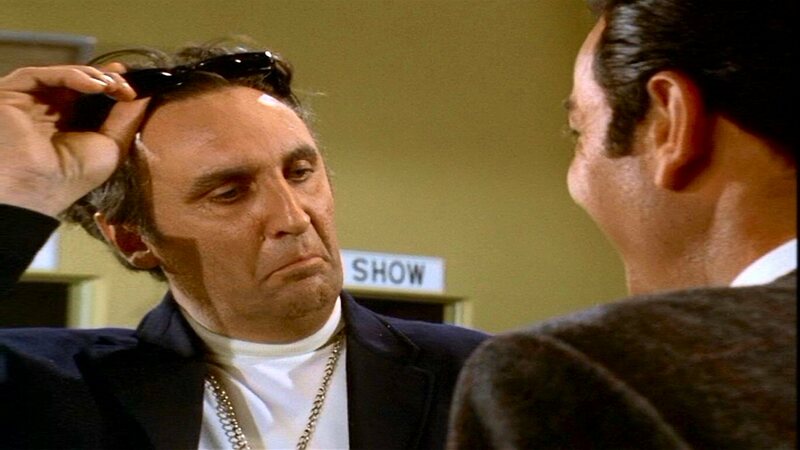 Groovy bookie Moose gets a load of his old pal Mannix (Mike Connors). At the helm for this episode was Stuart Hagmann, who enjoyed a brief career in television directing commercials, episodes of Mannix, Mission Impossible and Bronk, and several TV movies. He also directed the occasional feature film, most notably the student protest drama The Strawberry Statement (1970). He was apparently recently interviewed for the Mondo Film Podcast, but the posting has disappeared. This entry was posted in Film, Television and tagged april fools!, bronk, mannix, mike connors, mission impossible, mondo film podcast, stuart hagmann, the odds against donald jordan, the strawberry statement, timothy carey. Bookmark the permalink. Top ten Mannix episode for sure. Guest stars sre excellent and plot is tighter than most Mannix episodes. Should have kept Albie around. Hagmann’s direction is outstanding for 1970 relevision.. The cameraangles, the frame composition … just outstanding. Check out the sequemce eatimg hot dogs on the beach. All the shots of the gulls.